As an engineer one of the real treats in larger entertainment shows is of course all the technology. Eurovision was no exception. When we entered the arena everyone was given a Pixmob wristband. They contained 3 RGB leds and an ATtiny44A that were controlled by IR. 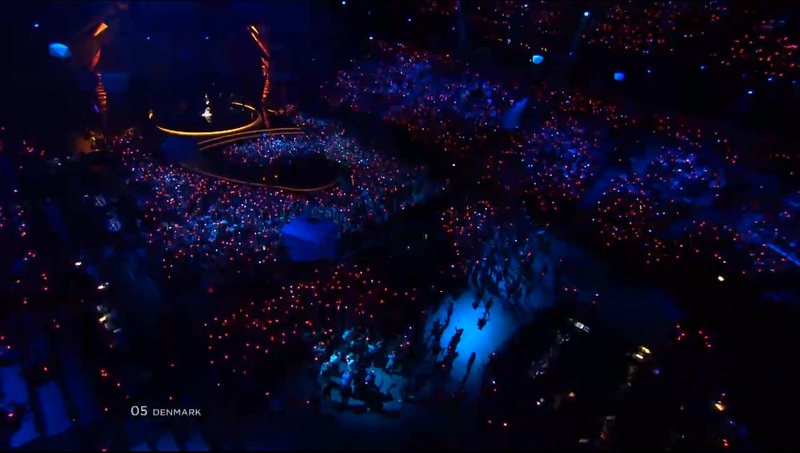 The control was insanely fast, the production crew could turn on/off all 11 000 wristbands in an instant. The IR transmitters were directed to different sections of the arena which allowed for sweeping effects too. Just when the show ended they sent out an impact command. The wristband would then light up for a few seconds after being shaken. many thanks for sharing that info. When I watched the show and saw all the wristbands turn on for the first time I thought "they must be remote controlled". Cool to see they had AVRs! I saw some close ups of the wristbands during the show - thought it was an intriguing idea. Coldplay had something similar on their recent tour. Interesting to see these the first time, boring after that. The company selling these things will probably saturate the market to the point that they become passe. the production crew could turn on/off all 11 000 wristbands in an instant. Indeed, very interesting with the AVR connection. The nagging question is: Will all those be handed in for recycling in an orderly fashion? Of-course not all of them, so what percentage will go into ordinary waste-bins etc? Or were they collected at the exits after the event? Johan: None of the wristbands were collected at the exits. Instead they were put in impact mode. The wristband would then light up for a few seconds after being shaken. Coldplay had something similar on their recent tour. And Disney has their "World of Color" hats. Which are a complete PITA to carry around the park with you all day before attending the show; I like the wrist-band idea much better. Hey, I brought two of the bracelets home from overseas, but took the batteries out so they would not flatten on the trip (since movement sensitive). Now cannot get them to operate. Has this reset them? How can I re-trigger them to operate again? Not an expert in this, but I'll throw out a couple possibilities that come to mind. Option one: You might have given it a static shock when removing or reinserting the batteries, in which case some part of the electronics would have been damaged. This is pretty easy to do without even knowing about it. Option two: the wristbands might store their status (such as whether they're in impact mode) in volatile memory, so removing the battery effectively resets them to right out of the box - if it didn't light up on movement when you first got it this is probably be the case. Some of the info on the company's website would seem to imply that it is not, however. Unfortunately, if it is the case that would mean that the only way to turn it back on would be to send the IR impact command that they sent at the concert to put it into that mode, which you don't know. With enough experimenting with an IR transmitter you might stumble onto it, but the possibilities are vast and I'm guessing you don't have one of those around the house anyway if you're "a non-techie," so the short answer is it could be just about impossible to re-trigger it. Since this is your first post here (Welcome!) I'm guessing you're here looking for a solution rather than as an electronic hobbyist, but making something like this wouldn't be entirely out-of-reach as a beginning project.